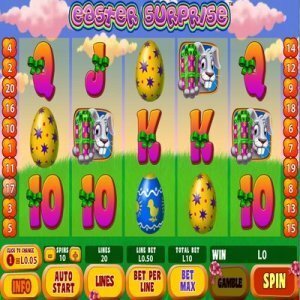 [miau] Those who enjoy video-slot machines with a cutesy side should give Easter Surprise a spin! Who Makes this Slot Machine? The creative minds at Playtech Software publish Easter Surprise. The Easter Surprise player can buy up to 20 pay lines, and the game spins five reels. What Symbols Are on this Slot Machine’s Reels? The symbols on the above list cover Easter Surprise’s “regular” spots. For symbols that can “go wild”, read the next section. Does this Slot Machine Offer Wild Symbols, “Scatters” or Other Special Features? Easter Surprise gives the player a wild symbol with an image of the Easter Bunny holding a gift. This symbol can substitute for any standard spot and create winning combinations. The game also offers a symbol called the “Easter Surprise Scatter”. When three or more scatters appear anywhere on this game’s layout, the player receives ten free spins that pay triple on all wins. The chance to spin and win for free is a slot-player’s dream! This game touts one more special feature. It goes by the name “Easter Eggs Bonus”. Whenever three or more bonus symbols land on the same pay line, the player gets to play a separate game on a different screen. The bonus game is simple, but it results in free credits added to the player’s bankroll. Easter Surprise’s top prize for one spin is 10,000 credits. If five wild spots land on one pay line, the player wins the top prize. Easter Surprise features colors and sounds that remind the player of the secular side of the Easter holiday. The game leans heavily toward the cute side. Macho types might be happier with other games, but Easter Surprise packs a good time!